Music is the greatest language mankind has. There is not a single race, religion, or tribe that does not use music in some form to communicate. It transcends spoken language. Even deaf people can understand music (see Mr Holland’s Opus or Pearl Jam’s Touring Band 2000). It would be a huge crime to relegate GarageBand to the mere status of Podcast or iMovie scoring tool. So to do GarageBand justice I did two things. Firstly I went to the Play Free and Easy event in Wellington to checkout what GarageBand had to offer. And I was astounded. I watched as King Kapisi laid down some drum beats then Brad Carter recorded an acoustic guitar track using the internal mic of his MacBook Pro (lucky sod). Then He laid down vocals once again using the internal mic and King Kapisi laid down beat-box and harmonies with an external mic. Then Scott Bulloch took over and tidied up some of the tracks by moving things about with a few clicks and drags etc. Then he did something that blew me away. I’m going to say King Kapisi did it on purpose but his harmonies were a little flat. I’m no muso but when the track was played on it’s own it was very noticeable. So with very little effort Mr Bulloch was able to align the music to the beat and tempo and clean it up and with very little effort the track was cleaned up and I sat there thinking that a consumer app shouldn’t be able to do what I was seeing GarageBand do. Think about this. There is no package like iLife ’06 on the Windows platform at least not for that cost. iLife ’06 costs around $141 thus each app costs around $23.50. GarageBand would be $141 on its own in the Windows world if not twice as much. So for an app that costs $23.50 to be able to do what GarageBand can do is truly amazing. The second thing I did to do GarageBand some justice (or injustice as the case may be) was to go out and do something I had been wanting to do for quite sometime. Buy a guitar and learn to play. By nature (contrary to what my friends say) I am quite shy and so a guitar and amp package was out of the question. Even an acoustic guitar is quite loud due to its design and so I went the tech head way. I bought an electric guitar and an M-Audio FastTrack USB recording interface which allows me to connect my guitar to my iBook. How did GarageBand fair with this? Flawlessly. I simply connected the box to my iBook, loaded up GarageBand, went to the Preferences and set the Audio Import to the FastTrack unit. From then on recording simply goes through that. Now I can learn to play and I can listen through my headsets while not disturbing anyone. Of course GarageBand isn’t actually limited to electric guitars. Electronic keyboards can be connected as well as drumkits. Actually even the internal mic can be used as I mentioned earlier. It might involve changing the Preferences each time but more expensive FireWire based units can have many devices connected so this might be a better option later on. Laying tracks down isn’t necessarily limited to real instruments. There are huge amounts of loops available and there are three ways of inputting these loops. The first is an electronic keyboard, the second is by using the actual computer keyboard, and the third is a somewhat clunky method using the mouse and an onscreen keyboard. If you don’t have an electronic keyboard I recommend using the computer keys. Editing of tracks can be done in two ways as well. Graphic mode shows a number of black rectangles whereas Notation mode shows actual notes as you would see in a music book. Each note can be moved about and the whole thing can be locked to the beat and tempo you set when you created the document on loading GarageBand. The big question is how does GarageBand perform on slower systems? Well, I use a 1.02Ghz 12" iBook with 30Gb HDD and 768Mb RAM. Aside from the RAM my system is pretty standard although I am running Tiger. It runs brilliantly and there is so very little lag if any. Of course as the project grows things can slow down and that’s where a cool feature of GarageBand comes in. You can "Solo" a track. This means that only the tracks you "Soloed" will play and so you can hear what is going on without bringing your system down. Of course the old adage of save often definitely comes true here but a tip from Scott Bulloch goes one step further. "Save As" often, this way if you stuff up you can revert to an older track and start again. I said it before and I’ll say it again. A consumer app should not be able to do what GarageBand does. 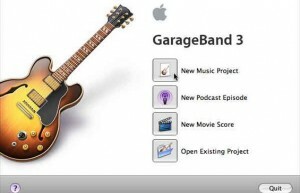 Clearly Apple sees GarageBand as being the most important app in the iLife ’06 package. It’s interface is more reminiscent of a Pro-App like Aperture or Final Cut Express than that of the other iLife apps. 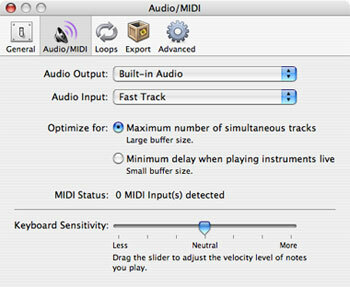 It is the ultimate tool for those who want to make music and distribute it to the world. An artist can make their single, turn it into a podcast, and export it to the Internet via iWeb. I haven’t even got into Ducking (the dropping of the background music whilst voice levels are audible) which is very handy for Podcasts but like I said, I didn’t want this review to be nothing more than GarageBand is a great podcast or iMovie scoring app. GarageBand holds its own weight but it holds the whole iLife ’06 package. If you only needed one reason to buy or upgrade to iLife’06 then GarageBand is that reason. It is a killer app that has no counterpart.